Returning to the “Uncured” label on bacon, I owe a big thanks to Chris from Vermont Smoke and Cure for his explanation. 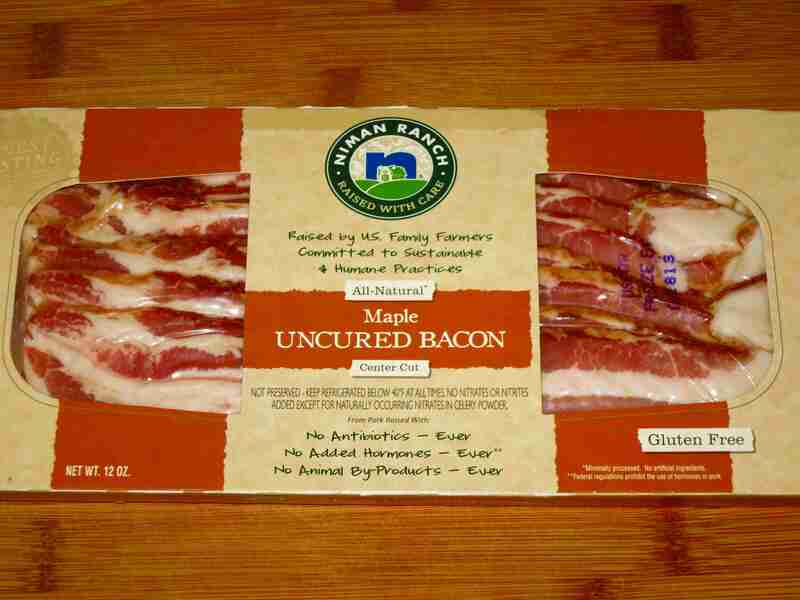 Apparently I should expect “Uncured” to appear on most of the bacon products that I will be consuming, since I tend to go for the ones which are void of unnatural products, which the FDA has determined requires the labelling “Uncured”. 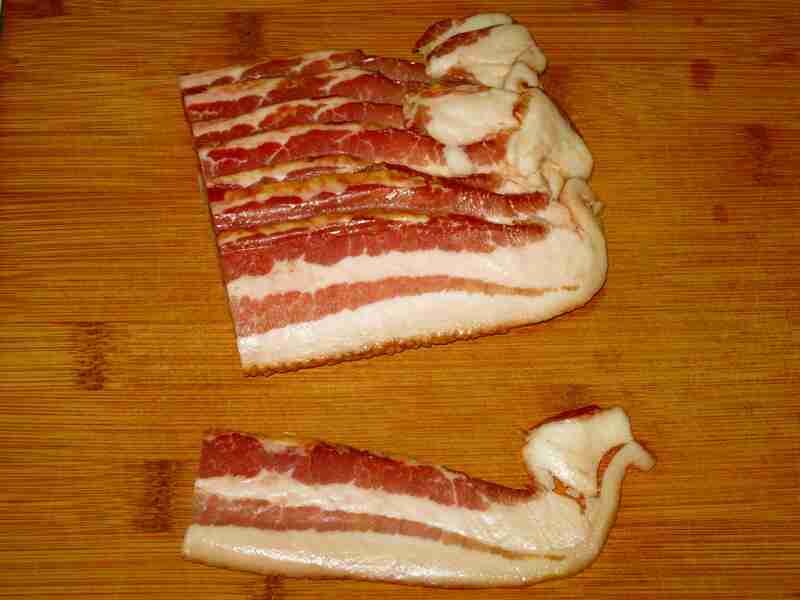 This likely has something to do with not eating the bacon directly out of the package, or something like that. My thoughts on that are not very nice things to say, so I’ll just not say them. The 1 lb package has 10 servings in it. Each serving has 1 gram of sugar; so the package has 10 grams of sugar. Realistic serving size: 2 servings per package. 5 grams of sugar in each serving. That’s not bad, which is why I bought it in the store. For a premium meat, raised by sustainable family farms (on the package and website), I don’t mind a bit of sugar. But let’s be clear: in my opinion the added sugar does not improve the product. 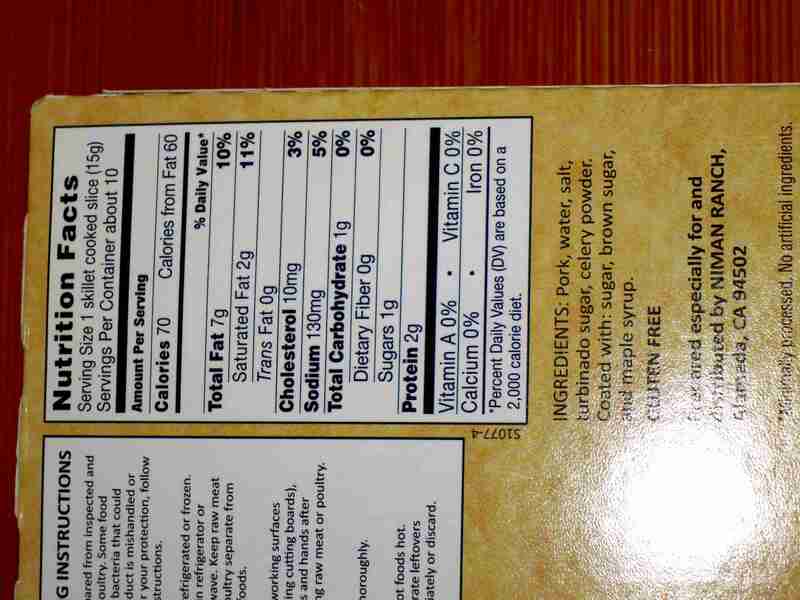 Cautionary Note: Some bacon producers will reduce serving size further so that they can put a “0” in the grams of sugar per serving under the nutritional facts. 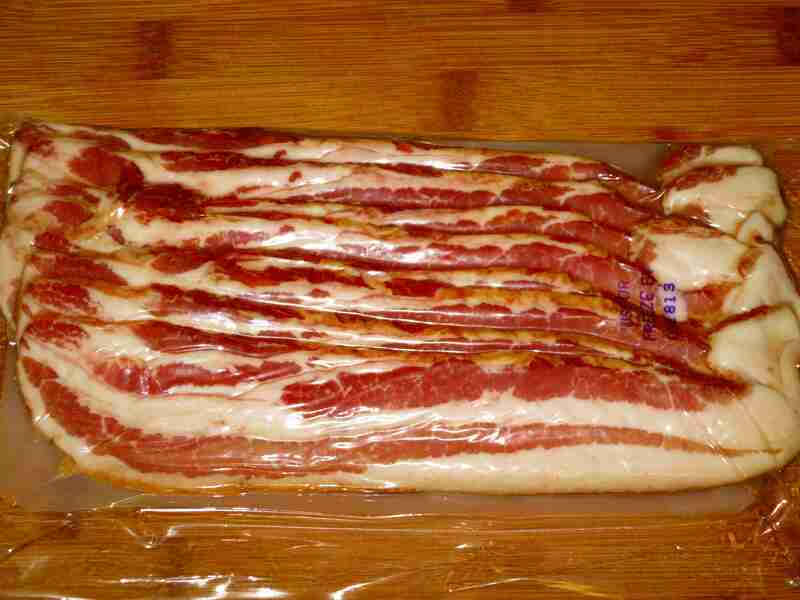 Do not buy these bacon packages! Because they put a “0”, there is no way to actually know how much sugar is there. After cutting it open, I smelled it. The scent carried a heavier “smokey” scent than the previous two bacon batches that I’ve had. 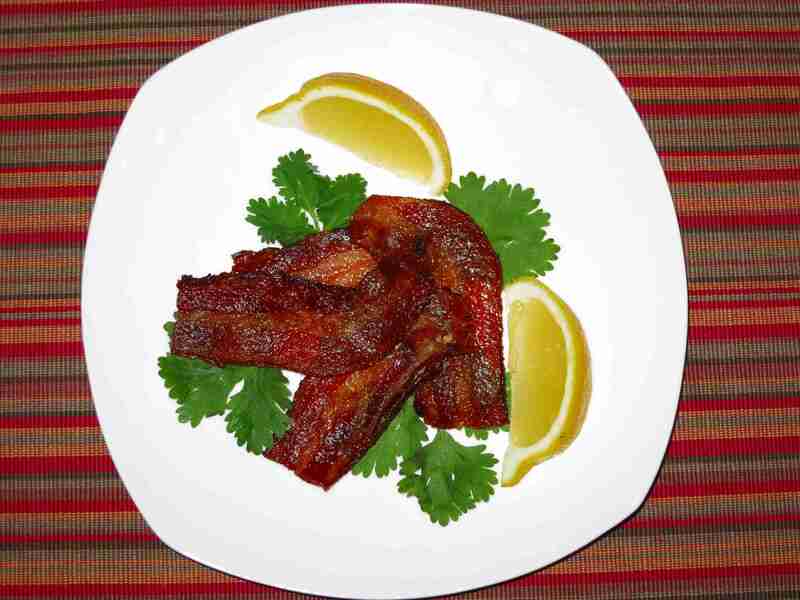 It wafted out from the bacon powerfully, and I could tell that the cooked smell would fill the house, and water my mouth! Perhaps because of the strong smokey smell, I didn’t smell any of the maple. I thought that was strange at the time, but elected to note it and move on. As I said, there’s a reasonable chance that the smokey scent overwhelmed the maple scent. Maple, even concentrated as syrup, is not a strong smell. The coloring was excellent. The red of the meat was striking, and bold. It was almost like it had been painted! Now, that could easily be a perception based on contrast. The meat was more marbled than most of my other Bacon Project posts, so it could be that it merely appeared strikingly red. Reviewing the pictures of my previous Bacon Project posts, it would seem as though that’s likely the case. Either way, I was impressed by the coloring. I cut the slices in half, so that each slice of bacon was about 5 inches long, rather than the 10 inches that they would be out of the package. Heating the bacon up, the smoky smell that I first smelled began to waft about the house enticingly. My wife, not the most patient of people, started walking in and out of the kitchen, doing “food laps” as we are fond of calling them. 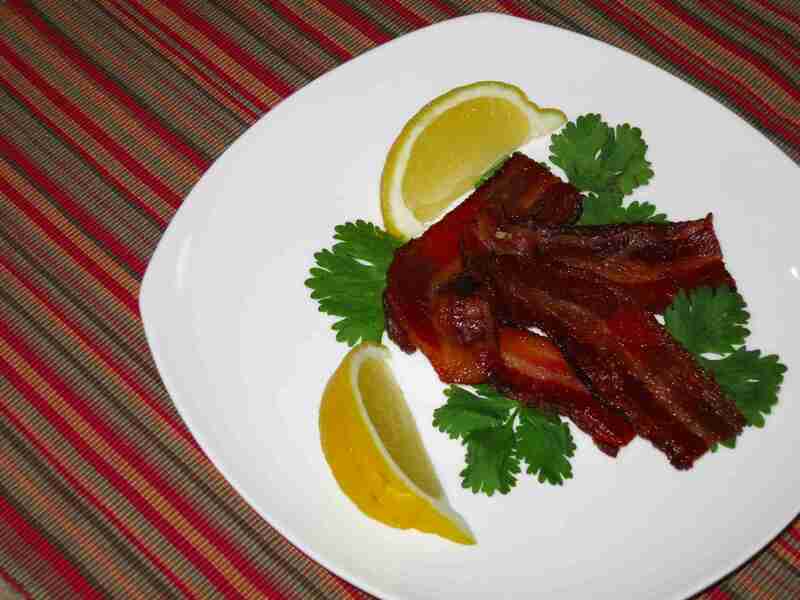 The bacon was definitely getting our mouths watering, and our stomach juices gurgling! On a slight down-note, the maple flavor that I was hoping would start to come out in the cooking was still not present. My wife’s sense of smell is superb wasn’t able to smell it either. I’m not sure if this is a batch-thing, of if the maple used was a less aromatic batch… Anyway, while the smoky bacon smell was quite appealing, I was expecting to get some of the maple smell as it cooked, and didn’t. 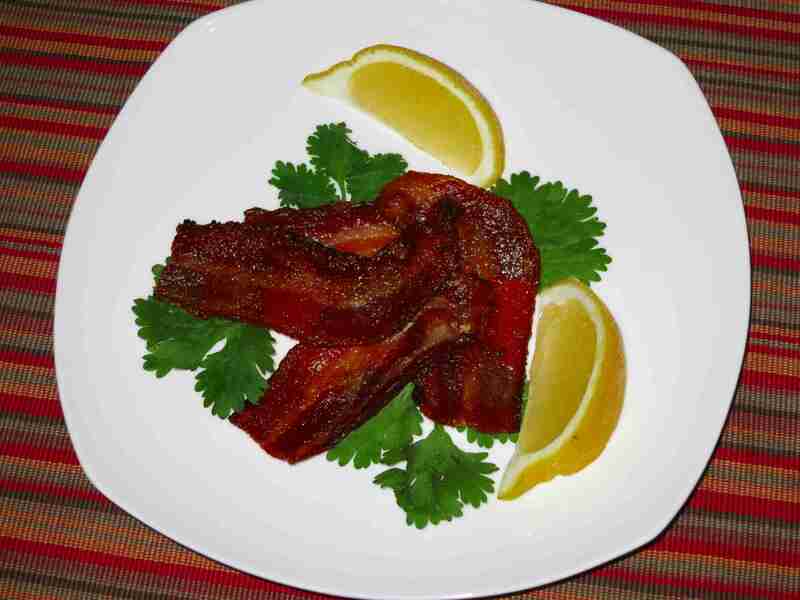 The smokiness of this bacon was sublime! I am very impressed by how well the meat and fat held on to the smoking process that Niman Ranch put it through! They must have had a higher water-vapor level in their smoke house, because the smoke flavor is deeply satisfying, and carries the flavor of the pork very well. As was true of the smell, the maple flavor was definitely missing in the bacon. I’m not terribly surprised by this: of the four sweeteners used, maple was the last of them, and in 5 grams of sugars, there isn’t a whole lot of room to skimp on the maple if you expect the flavor to come through. I understand: maple is expensive. But if you want to compete for repeat business, you’re going to have to step up your game. The bacon was very good. As bacon products go out there, this definitely qualifies for the “premium meat” title. The smoky flavor was top notch. The coloring was excellent. It wouldn’t surprise me to learn that some of the reason for the coloring was the way that they smoke the meat. As I mentioned, a higher water-vapor level in the smoke house will transfer the flavor better. This will also transfer the nitrates from the celery, and make the meat red. So it could all be related. On the downside: I felt a little disappointed by the complete lack of maple flavor. There was clearly maple syrup in their product, it’s on the ingredients. But the ingredients also show that price was a more important consideration than flavor for the producers: they skimped on the maple in favor of other, cheaper sweeteners. My advice: get rid of all the sugar, it’s completely unnecessary. Use only maple syrup for the flavoring, and use only enough so that the flavor comes through. There’s no need for 5 grams of sugar in a 1/2 lb serving – 2 or 3 grams will do just fine, and if it’s all maple syrup, it will taste incredible! This bacon does not compete with either of my previous American Style bacon reviews. If you have either of them available to you, skip this one and buy those. For my Bacon Project posts on the other, better brands, please take a look at the Bacon Project page. The critique over with, here is what I use as a baseline for evaluating my bacon. This one gets a check-mark for all four categories! This is only the second time a Bacon Product has earned a check-mark in all four categories! This is impressive, and deserves a bit of patronage. Fortunately, my guess is that the other, better brands are also more challenging to come by… So when you can’t get Vermont Smoke And Cure, Niman Ranch is an excellent second choice! Whole Foods – I picked this up at Whole Foods. Because this is sustainably farmed pork, I will keep my eyes peeled for this at Stop And Shop, Shop Rite, Pathmark, A&P and the other major chains. If any of you stumble across this, let us know so that we can keep track of where it’s available. Thank you all for reading another of my Bacon Project posts! Yes! That’s the best one yet!! On a somewhat related note: if you really want to take a look at some bacon, take a look at this other blog I go to: 365daysofbacon.wordpress.com. It’s top notch! They were very good – I really enjoyed the smoke flavor, it was one of the most intense smoked bacon I have tasted in a while, and I loved it! Also, it really makes me feel good to be supporting a company who sources their meat from sustainably farmed pig farms! ← Crock-Pot Smoked Beef – First Try!